A recent paper in the National Bureau of Economic Research titled “Air Pollution and Infant Health: Lessons from New Jersey” examined a large sample size of infants and mothers. Using information from air quality monitors near children’s residences, researchers discovered “consistently negative effects of exposure to pollution, especially carbon monoxide, both during and after birth.” This really doesn’t come as any big surprise to me, but research like this is important in substantiating why we need stricter clean air regulations. First, because we know the exact addresses of mothers, we select those mothers closest to air monitors to ensure a more accurate measure of air quality. Second, since we follow mothers over time, we control for unobserved characteristics of mothers using maternal fixed effects. 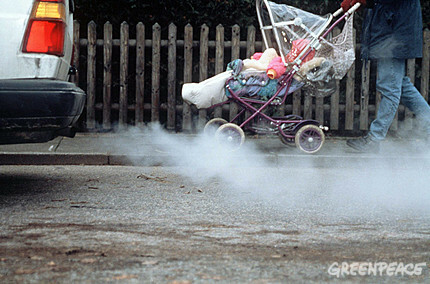 Third, we examine interactions of air pollution with smoking and other predictors of poor infant health outcomes. Because infants are small, and many have respiratory problems to begin with, CO may be particularly harmful to them. Nationwide, 77 percent of CO comes from transportation sources, while as much as 90 percent of CO in cities comes from motor vehicle exhaust (Environmental Protection Agency, January 1993, 2003b). Our strongest and most consistent set of results show that CO has negative effects on infant health both before and after birth. Since most CO emissions come from transportation sources, these findings are germane to the current contentious debate over proposals to further tighten automobile emissions standards. I think this research is very important to the naysayers on global warming who oppose tighter pollution regulations. If you don’t believe in protecting our planet’s health, what about our infants’ health? I also find it ironic that many people who support the right to life do not support the right to a healthy life. I hope you don’t mind that I linked this on my facebook. Thanks for your blog. It’s great. It’s so bad . This pollution is enough to kill a baby .